I’m determined to keep making things that have “summer” in the title even after fall officially starts. I saw not one but two farm stands selling pumpkins on our recent Vermont vacation, and that has kicked me into overdrive with the summer recipes, and this one is one of my faves, full of summer squash and local tomatoes and cheery basil. 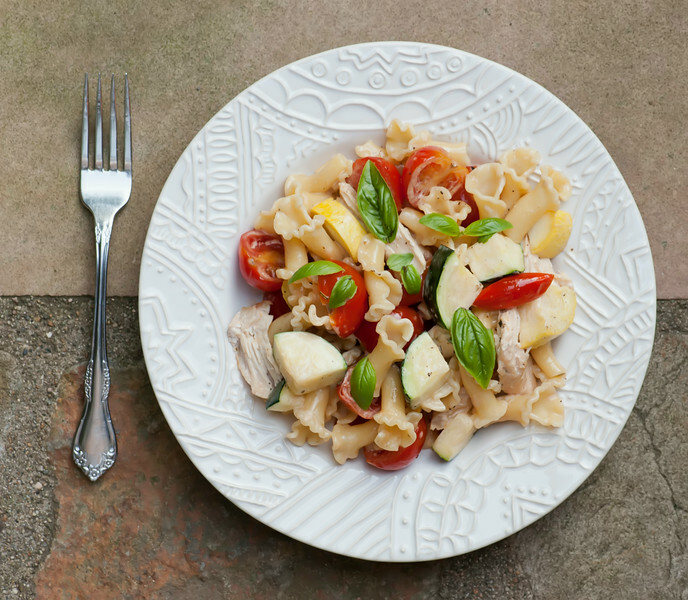 You can either cook up the chicken for the recipe or use leftover chicken, and it all gets mixed into pasta with a sweet cream sauce. Let’s go cook up some summer! You are going to need about two good sized chicken breast halves worth of chicken. If you have leftover chicken (say from making my favorite buttermilk rosemary grilled chicken lately…hint hint) that will work just fine, otherwise you can saute some chicken specifically for this recipe. One way or the other, you want to tear it into bite sized pieces, and I do mean tear it. Get those fingers in there. Unlike cutting it, tearing will give you nice nooks and crannies to hold the sauce. Next, saute up some summer squash in a large deep pan (it can be the same one you cooked the chicken in) until it is tender. I like a mix of yellow squash and green zucchini just for the prettiness of it all, but you can use either or both. Scoop it out and move on to the sauce. Add some sherry to the skillet along with some halved cherry tomatoes and simmer it up for about 5 minutes. Now stir in some cream and simmer a little more. You are almost done! Add the torn chicken, the squash and some cooked pasta and stir it all around until everything is warm and coated with the delectable sauce. Taste and season with salt and pepper. Now ladle it on to plates and scatter some fresh basil over the whole thing. I like to use a mixture of chopped basil and whole little leaves. And there you have it. A plate full of summer. Eat it outside for maximum summer happiness! Heat remaining olive oil in the same skillet over medium heat. Add squash and cook until tender, about 5 minutes. Scoop out and set aside. Add chicken, squash and cooked pasta to skillet and stir until everything is heated through. Taste and season with salt and pepper. Ladle onto plates, garnish with basil and serve. 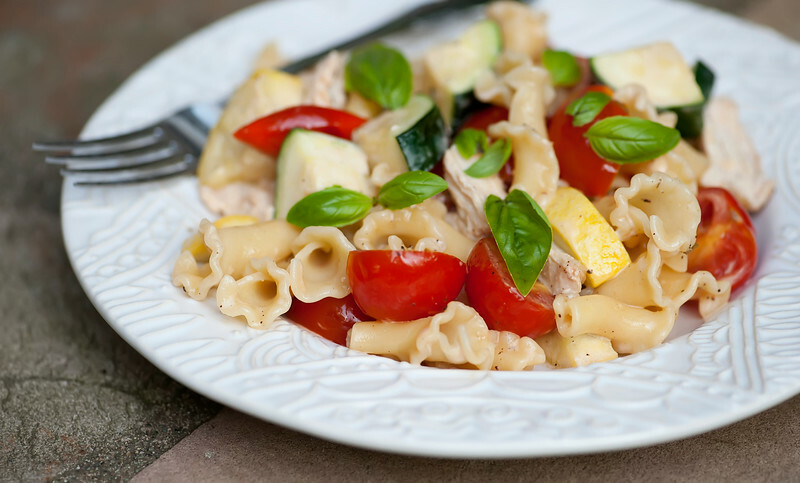 Fresh veggies, chicken and pasta are always a hit! Does the alcohol cook out in the simmer?